Your first step toward preparing for potty training or getting it back on track is determining how much difficulty you will likely encounter starting full-on potty training right now. Our downloadable Potty Ready Quiz can help you decide whether now is a good time to start potty training, or if you might want to hold out awhile longer before you give it a shot. The Potty Ready Quiz is ready for you to download immediately once you confirm your subscription to our free emailed Antsy Pants™ Alerts series of potty training tips. 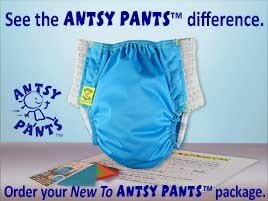 Antsy Pants™ Alerts are intended to prepare you to help the little one (or ones) in your life transition from eliminating in diapers to using the potty. We'll talk about what potty training is, how it differs depending on the age and attitude of the child, and tell you what gear will make potty training easier on you. The tips themselves are sent as a series, one message per day at most. As part of your subscription we will also occasionally send special messages to tell you about something new that we think you'll be interested in. Of course, you are free to unsubscribe at any time and the Potty Ready Quiz is yours to keep. 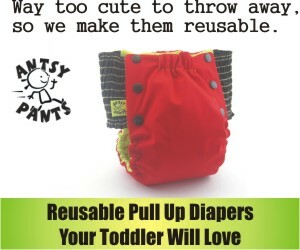 Learn more about how Reusable Antsy Pants™ Pull-Up Cloth Diapers can play an important part in teaching your child to know when it's time to go potty.